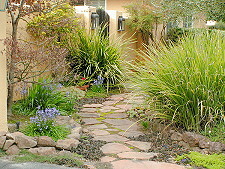 Sonoma Landscape offers tips on creating and installing a successful hardscape design. "Hardscape" consists of the inanimate elements of landscaping, especially any masonry work or woodwork. For example, stone walls, concrete or brick patios, tile paths, wooden decks and wooden arbors would all be considered part of the hardscape. But by extension, anything used in landscaping that is not part of the softscape can be considered a hardscape element, including home accents such as water fountains.